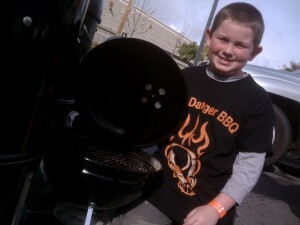 We finished 5th amid 55 teams with 6th Ribs, 9th Pork, 12th chicken, and 15th brisket. 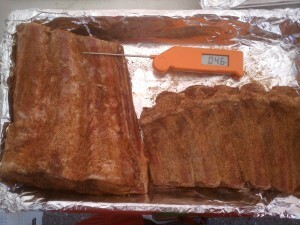 We also came in 8th in Beef Ribs which was an additional entry. Fred Flinstone Beef Ribs were Huge! 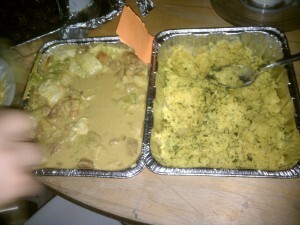 There was a St. Patty’s Day Potluck contest on Friday and I tried my hand at cooking St. Patty’s Day in Thailand with my Thai Green Corn Beef Curry and Green Rice. The crowd and judges enjoyed it as it was all eaten; however, it was not the winning entry which was not surprising since this was not a traditional Irish dish! 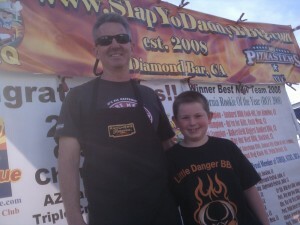 Dangerous Dave of All Sauced Up BBQ team and Little Danger! Congrats to Big Poppa Smokers for GC and Swine Assassins from Iowa for RC. Congrats to all who walked. 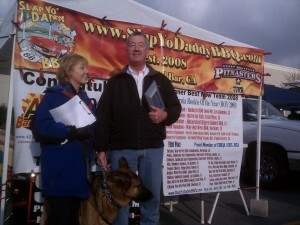 Thanks to Kelly and Kathleen our KCBS officials, Henry Silvestre for organizing this event, judges, and helpers. KCBS Reps Extraordinaire - Kathleen and Kelly! 2010 Smokin for Gold State Championship, Placerville, Calif.